Contact us if you have any questions or concerns about your health or products. Our staff is highly trained and board certified in modern and alternative medicine. Santa Monica Homeopathic Pharmacy strives to maintain the most up-to-date information from research or studies on alternative and integrative medicine. Owned and operated by healthcare practitioners since 1944. Get 20% off your first order of Metagenics products. Set yourself up for autoship every 30 to 90 days and continue to receive 10% off every order. Go to: smhp.metagenics.com The discount will show up in the final shopping cart. This product is not available for online purchase. 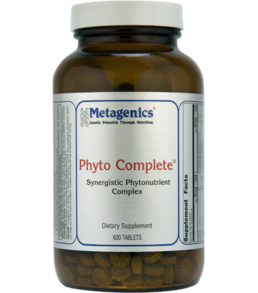 This formula naturally delivers a comprehensive blend of vitamins and minerals. Premium grade cracked flower pollen extracts. A balanced combination of Chlorella, Dunaliella, and Spirulina algae, wheat grass, and barley grass. Contains whole food concentrates of broccoli, carrot, cabbage, and tomato. Other Ingredients: Dextrose, microcrystalline cellulose, croscarmellose sodium, tricalcium phosphate, silica, cellulose coating, magnesium stearate (vegetable), and salt. Formulated to Exclude: Dairy products, egg, nuts, tree nuts, fish, crustacean shellfish, colors, and preservatives. See Allergen Statement. This product is produced in a facility that produces products containing soy, wheat, egg, nuts, tree nuts, dairy, fish, and crustacean shellfish. Directions: Take 5 tablets daily or as directed by your healthcare practitioner. Caution: If pregnant or nursing, or taking medication, consult your healthcare practitioner before use. Keep out of the reach of children.